In 2003, two companies named Square and Enix merged, and everything went crazy. It was one of those Transformative Genre Moments, you know? The world's two biggest JRPG franchises—Final Fantasy and Dragon Quest—now belonged to the same company. Since then, both series have gone down very strange paths. Final Fantasy went back to its medieval roots with the Vagrant Story-influenced FFXII, then stumbled into the PS3/360 era with some polarizing games, a string of awkward spinoffs, and a disastrous MMORPG that has since been revitalized. There's a lot riding on the next one, Final Fantasy XV, but nobody really knows what to expect from it. Meanwhile, Dragon Quest went handheld—and almost went real-time before fan outcry changed the developers' minds—with DQIX, then got all multiplayer on us with DQX, which hasn't even come out in the west, like half the other spinoffs and remakes that American DQ fans are patiently waiting to play. In other words, both Dragon Quest and Final Fantasy are in a very strange place. Traditionally they've been seen as counterparts—Dragon Quest is the conservative uncle who's always fun to be around, even when he gets drunk and makes you repeat the same things over and over again; Final Fantasy is the wacky aunt who always comes to Thanksgiving in a totally new costume and experiments with crazy dishes like marshmallow bacon (sometimes delicious—always weird). Today both aunt and uncle are kind of sick, but there's a new dinner guest in town: Bravely Default, the little RPG that could. Bravely Default doesn't just want to be that distant cousin who comes to your party one year, goes hard, and then never shows up again, leaving you to occasionally muse about what ever happened to that Bravely guy because hey you kinda miss him. Bravely Default wants to be a yearly tradition. See, Bravely Default was originally created as a sequel to Final Fantasy: 4 Heroes of Light for the DS, producer Tomoya Asano told me during a phone interview this week. When you play it, you can tell; this is not a game afraid to emulate old classics. Even the names are all straight out of Final Fantasy, from firagas to echo herbs. It feels like an old FF game. But Asano has grander plans in mind. "We decided early on that we would like to challenge ourselves with the opportunity of creating an entirely new title that wasn't related to previous games, and we felt like that would spur us on to completely different directions for this kind of game," Asano said, speaking through a translator. I'd asked him why they didn't just call it Final Fantasy, and, if they weren't going to call it Final Fantasy, why keep all of the tropes we only know in those games? "Certainly when you look at [Bravely Default] and you think about some of the elements here like turn-based combat or a job system or even the fact that people are exploring a world looking for crystals, you definitely start to get the sense that there are a lot of classic Final Fantasy elements," Asano said. "And I think that the names you're talking about were just another one of those factors where we felt like these are things that are familiar to people. They make it easier for [those people] to get into the game. So we decided to keep them intact for that reason." This is step one. Part A of Asano's master plan. He's been explicit about his desire to turn Bravely Default into an annual franchise, and he echoed that ambition during our conversation. "We would like to do a new Bravely Default every year, and we've actually already announced Bravely Second in Japan, and hope to be releasing it this year," Asano said. "But I do believe that Bravely Default will continue to evolve in its own direction. It may return some of the world feel, for example, the crystals being an important story element. But I believe it's going to be generating a lot of its own new terms as well." It's funny—two decades ago, in order to boost sales in North America, Square changed the titles of Saga and Mana games to Final Fantasy Legend and Final Fantasy Adventure. Today, they're changing games away from Final Fantasy. Kinda says a lot. It's a smart move, though. 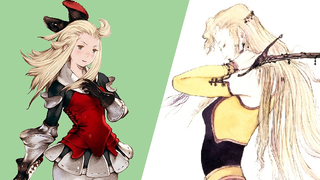 It might be tough to imagine us having to say "Bravely Default" for the next decade, but given the quality of the first game, it's easy to picture a future where this series stands side by side with Square Enix's other titans, filling the gap between Dragon Quest and Final Fantasy and helping satiate fans' cravings for traditional fantasy romping. Imagine a world where, in addition to their big spectacles on console, Square Enix puts out a new handheld traditional RPG every year or two. Granted, RPGs like Bravely Default might not bring in the type of profits that Square expects, considering their ridiculous financial expectations for games like Tomb Raider and Sleeping Dogs. But handheld games are not nearly as expensive to develop as those AAA giants, nor are they as likely to go through development slogs as the teams try to figure out how to get the most out of increasingly complicated hardware. I don't know whether Asano and crew will stick with the 3DS, but they should. It's a perfect fit. More importantly, a series like this can bring in fan goodwill. Assuming Bravely Default gains some traction in the west—and Asano told me that he'd like to see the sequel localized as well, but that will depend on sales here—I think people disillusioned with Square Enix's newer decisions will find some comfort in a franchise like this. If Final Fantasy continues heading down the slope of sloppy ports and atrocious mobile spinoffs, and if Square loses all interest in bringing Dragon Quest to the west, at least we've got a strong third option—and one day, maybe even a replacement. So let's imagine a future with two Final Fantasys. There's the old one, yes, the one called Final Fantasy—this is the series that could go up, and down, and everywhere in between, as its creators experiment with zippers and l'cies and gods that turn into motorcycles. And then there is "Bravely"—a series that could break out and become a refreshing, traditional alternative to Final Fantasy, with its own twists and turns and eventual evolutions. It'd be more than welcome.